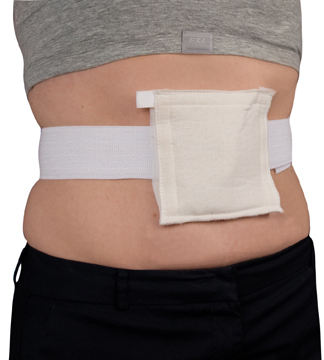 G-Tube Belt is a more comfortable way to secure all types of enteral feeding tubes including PEG tubes, gastrostomy tubes, and jejunostomy tubes. 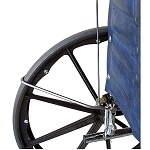 Secures Peg Tubes, G-tubes, and most other enteral feeding tubes. Soft, comfortable elastic waist band. Eliminates need for pins and tape. 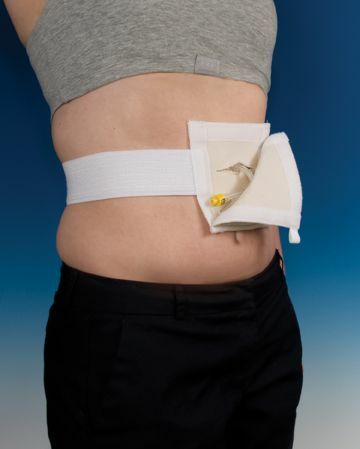 The G-Tube Belt provides a comfortable way to secure all types of enteral feeding tubes including PEG tubes, gastrostomy tubes, and jejunostomy tubes. This soft belt with pouch eliminates the need for clumsy pins and tape. The G-Tube Belt increases the user's level of tube control, helps increase self-care and minimize the risk of accidental pull-out by combative patients and small children. 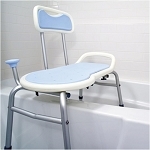 Caregivers should first consult a physician before using the G-Tube Belt. 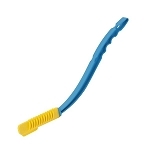 It is recommended that a sterile drain sponge with slit for tube entry be placed against the skin as a buffer. Wrap waist strap around waist and secure to a comfortable fit using the hook and loop closure for adjustment. Slide tube through slit to pouch and position pouch over tube accordingly. 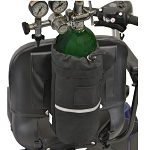 Secure tube while not in use by coiling onto pouch face and then close bottom flap securely over tube coil. Care Instructions: G-Tube Belt flannel center pouch and soft elastic fabric waistband are conveniently machine washable. Hand or machine wash with a mild disinfectant and hang dry. Be sure to engage the hook and loop fasteners before washing to prevent lint accumulation. 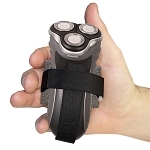 Pouch measures: 5 x 5 1/2 inches overall, 4 x 4 inches inside opening. Standard size fits: 30 to 45 inch waist size. Large size fits: 46 to 60 inch waist size. I ordered 2 of the G-tube belts for my brother. He is 31, and recently lost the ability to swallow after a brain tumor was removed. The pouch is absolutely amazing for him! As soon as we put it on, he felt so comforable. He no longer has to deal with taping the tube to his stomach to keep it from pulling down on the insertion site. The material in is very soft and comfortable against his skin, and it helps look smoother under his clothes. Well worth the investment. I love my new g - tube belt, I was using band and it was so bulky and uncomfortable under clothes and the tube wasn't really contained very well. The g - tube belt is comfortable and easy to wear, I referred it to the nurse at my oncology clinic and she was going to give the website to the patients with feeding tubes. I got this for a friend who just got a feeding tube before she starts radiation therapy. She loves her G-tube belt. She says it is very comfortable and much nicer than taping the tube to her skin. We bought this for my father, who has had a PEG tube since a stroke more than 18 months ago. During that time, he has been taken to the hospital 5 times to replace a tube that fell out. On four of those occasions, he had an abdominal binder on over the tube, but it wasn't enough to keep the tube in place. Now we put the G-tube belt on first and then the abdominal binder over it to keep everything in place. Great product! I have a son that pulls his peg tube out and have used many methods to keep him refrained from doing that. This belt was soft, loved the cover over it.....but once the peg is secured he yanked on the cover and peg and belt and all came off! 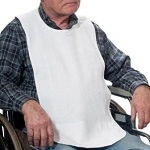 I feel the square cover needs to be over the belt to the back area where it cannot be accessed by only a caregiver. My son is 23 with multiple things going on and if this is the one thing I was so happy to help...didn't and I wish I never bought it! This disappointed me and I will never buy another product from your company. Some things need to be considered and what could be a safety issue to the person wearing it! Q: How do we know what size to get ? A: Per the product description, the standard size fits 30 to 45 inch waist size and the large size fits 46 to 60 inch waist size. Q: What is it made of? Fabric? A: The pouch is flannel and the waist band is a soft elastic fabric. Q: This comes with the belt & cover? A: Correct, the elastic waistband strap and center pouch is what is included. A: Unfortunately the G-Tube Belt is probably too large for children. Q: My sons waist size is between 25-29 inches. Will the standard belt fit him? A: The standard fits 30 to 45 inch waist size. However, you could probably hem the elastic waist strap to fit him. Q: Do you have small feeding tube belts for small waist ? A: The smallest waist size the G-Tube Belt will fit is 30 inches, however, the TUBBEZZ Feeding Tube Belt (Product Code: CCS510) will fit waists as small as 20 inches. Q: What are the measurements of the g-tube adult belt for standard vs. large? A: Standard size fits: 30 to 45 inch waist size. Q: size around waist ? Q: Do you supply to the UK? A: Yes, International ordering is available. Please refer to the Ordering Info - Help + Policies in the upper right corner of website for details. Q: What is the size range for the standard?